Micron is one of the oldest names in the business. Formed in 1978, they were one of the “founding fathers” of the computing age. Their consumer-facing arm, Crucial, has been delivering high-quality memory modules for decades at this point, earning a reputation for their value-focused sticks, as well as their high-end gamer-focused efforts. I recently got to check out the latest in their Ballistix Elite DDR4 memory modules, and I have to say that I’m very impressed. While I did have an initial stumble, a little bit of work reaped a great many rewards. As you can see below, the Ballistix Elite sports a robust set of aluminum heat spreader fins. Fully populated, I didn’t see my board move one degree above normal, but had there been a problem, the Elite modules also have an embedded thermal sensor for real-time temperature monitoring to keep your rig safe. 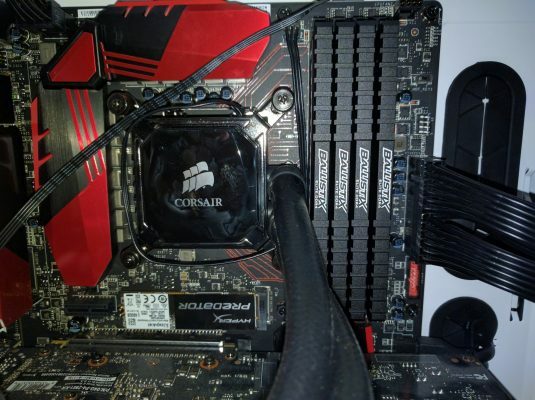 The platform for testing the Crucial Ballistix Elite memory is the MSi Z170A Gaming M7 motherboard, powered by Intel i7 6700K Skylake processor. The Gaming M7 is capable of handling 64GB of DDR4 memory with overclock speeds up to 3600MHz. For power and cooling, I trust Corsair, so this rig uses a HX1000i PSU and Hydro H60 water cooling system, respectively. I also have an EVGA GeForce 980 graphics card to finish things out. For an OS, I’m running Windows 10 x64, and it’s assumed that all drivers and firmwares are up to date at the time of this writing. Before we dig into the review proper I want to talk about CAS latency. CAS, or Column Address Strobe, is the number of clock cycles that pass from the time an instruction is given, and when data becomes available. Calculating what this means is a fairly complex bit of math that is still very much open to interpretation, but know that even though CAS Latencies values have continued to rise, the technology improvements have resulted in shorter latencies. In the end, the first DDR memory modules (CL 2.5) had a 15 nanosecond delay between “ask and answer”, and DDR4 manages to pull that down to 13.5 nanoseconds. It’s obviously marginal, so finding a memory module with a lower CL rating probably won’t result in a faster outcome. 4x Ballistix Elite DDR4 memory modules mounted didn’t move the temp gauge one degree. In the case of memory modules that run natively at DDR4-3600MHz, most have CAS latency of 18. The Ballistix Elite’s CAS is 16 — two nanoseconds slower than the likes of Corsair’s Vengeance line (true latency (ns) = clock cycle time (ns) x number of clock cycles (CL). While I don’t have a set of Vengeance to cross-compare, experience tells me that the difference between the two is so negligible as to be nearly impossible to measure, much less notice in a gaming scenario. Generally speaking, memory usually ships with fairly conservative timings and speeds to ensure compatibility with the largest array of motherboards and processor combinations. XMP, or Extreme Memory Profile is a technology from Intel that is meant to allow folks who aren’t into tinkering with voltages in their BIOS an easy way of overclocking or optimizing the speed of their memory. To do this, memory timings and speed defaults are pre-loaded as profiles within certain motherboard chipsets. Coupled with some bits of software, or sewn directly into the BIOS, XMP is just a few selections to push your memory beyond those safe settings and into higher speeds, or at least that’s what Intel would have you believe. During this review, I’ll show you what those higher speeds yielded in terms of real-world benchmarks. The “Try it” option fixed the issue. Loading up the modules and checking the BIOS, I immediately noticed that the memory was only showing up to the party with 2400MHz. I enabled XMP in my BIOS and rebooted and found the same results. At the time of writing, the board simply would not bump up to the advertised 2666MHz speed with the XMP profile. This isn’t my first foray into BIOS-land, so I popped into the motherboard’s Overclocking section. Within the DRAM settings I found “Memory Try It!” which is MSi’s way of offering XMP-like pre-built settings. Within I found a mode for Micron memory and a base setting of 2666MHz at CAS of 16 — exactly the baseline where I intended to begin. While I will bring synthetic benchmarks to the table for this review, it’s real-world performance that matters, and that means games. I currently use Far Cry Primal, Batman: Arkham Knight, Shadow of Mordor, and Mirror’s Edge: Catalyst to test speed impacts on framerate. All games are running at 1080p and maximum settings, with all additional features enabled (e.g. NVidia Paper Debris / Smoke and Fog in Arkham Knight, “Hyper” settings for Catalyst). Most of my reviews are written from the ‘easily reachable’ perspective. This means I play on Normal difficulty levels, and when it comes to hardware, I tend to stick to the automatic settings. While it’s certainly possible with the right memory, processor, and board, to push hardware well beyond the numbers I’m reporting by adjusting individual registers and voltages, for the purposes of this review I tested at 2666MHz, 2800MHz, and 3000MHz settings — the available non-manual profiles. These are what the vast majority of you would feel comfortable using, so it’s the most relevant to the masses. The first title I tested was Shadow of Mordor. At 2666MHz — the advertised speeds of the Ballistix Elite, I was able to get an average framerate of 87.11, with a maximum of 151.73, and a minimum of 52.29fps. Pushing the memory up to 2800MHz, I was surprised to see the average jump up to only 87.75fps. Re-testing at 3000MHz saw the framerate remain solid at 87.15. Even the average remained within a single frame, despite a 333MHz increase in speed. Shadow of Mordor at 3000MHz setting is shockingly consistent. Next up for testing was Batman: Arkham Knight. All development woes aside, the game is gorgeous and capable of dragging even the beefiest system to its knees. At 2666 I pulled down a minimum of 39, a maximum of 103, and a respectable average of 68fps. Once again, at 2800MHz and 3000MHz I saw very little difference between the numbers, with the average remaining solidly at 68fps across all three settings. The next game of the batch is Far Cry Primal — another gorgeous game that’ll beat up all but the most stalwart of machines. At 2666MHz I saw a minimum of 96, an average of 109, and a maximum of 121fps. At 2800MHz I saw the minimum wobble to 87, with the average hitting 107, and the maximum seeing 120. When I set the speed to 3000MHz, the minimum framerate sat at 95, with the average remaining at 107, and the maximum at 121. Far Cry Primal at 3000MHz has some variance, but it’s marginal. Mirror’s Edge Catalyst was built with the Frostbite 3 engine. While Faith’s previous outing was aimed at a 30fps experience, this new title is aimed squarely at 60fps. Heavily optimized, the engine uses all available CPU cores, and every square inch of GPU real estate you can throw at it. It’ll run well (around 50fps average) on a $170 GeForce 960 video card at Ultra, so it wasn’t a surprise to see it hitting high framerates on Hyper with my GeForce 980. Running the memory at 2666MHz I found average 68fps. Pushing memory speeds up to 2800MHz yielded a single frame difference, but pushing to 3000MHz found the framerate hitting 72fps on average. Mirror’s Edge Catalyst’s gorgeous geometric landscapes and high-resolution texture work makes it a very demanding test for hardware, and I’m happy to see it push my new system’s limits. Mirror’s Edge Catalyst at 3000MHz is absolutely gorgeous and highly stable. It’s important to point out that the exact framerate numbers don’t matter very much, per se. Running a benchmark several times (I run them at least five times and choose the average of the bunch) will yield similar but not exact numbers. I think Far Cry Primal demonstrates this best as you’ll notice the number of frames rendered in each pass is different. I think all four of these demonstrate clearly, however, that faster speed memory is not going to revolutionize your framerate. The simple explanation is that it’s your GPU that’s doing all of the heavy lifting — memory is not the bottleneck it once was. Adobe Photoshop is very memory intensive, and the more layered the drawing you are manipulating, the more memory your system will need. Better than any synthetic test, working in Adobe Photoshop CS6 and rendering video are two of my go-to real life application tests for any hardware. On the video side of things I use Cyberlink Powerdirector 12 Ultra, cobbling together videos that, when raw, are well over 100GB in size and transcoding them into something usable on the web. Both are very memory intensive, and quantity matters as much as quality and speed. While I didn’t find a perceptible difference between this and my other modules from Kingston, Corsair, or GSkill, they did hold their own and remained stable, even at higher clock settings and load. The extra capacity at 64GB did mean I saw less hard drive writes, but you can get capacity with those other modules as well. I did expect to see a result here, but found very little difference. Where I expected to see the most improvement was in the realm of video editing. Sure enough, and for the same capacity reasons as Photoshop, not having to go back to disk writes when memory stores were exhausted resulted in a small amount of improvements on projects in excess of the 64GB. How small? On a render that would normally take just over 8 minutes, it completed in 7:42 instead. That’s not a massive amount, but 7% is certainly a measurable change. While I don’t have a massive databank of benchmarks for comparison, what I do have is representative of what an average consumer might have in their home. Below you’ll find a quick cross-comparison showcases that I built for read and write values across those several modern systems, and in a stock and overclocked state. My weapons of choice for benchmarking is AIDA64 Engineering Edition, comparing them to other modules I have at the ready. 2666MHz was our base benchmark with AIDA 64. Although my board is capable of pushing memory up to the 3666MHz range, you’ll notice that even in synthetic tests I’m not showing more than 3000Mhz. Using some fairly loose timings, I was able to get the memory past boot at 3333MHz, a fair amount faster than the advertised speeds. While I was able to run short-burst synthetic tests, gaming lockups were a little too frequent for my tastes. CPUs and memory have different quality, even in the same line of hardware, so your memory modules may or may not be able to hit the numbers shown. In the end, I valued stability over the marginal speed differences. 2800MHz is an easy overclock. Here’s the AIDA 64 benchmark. It’s pretty amazing to see technology improving before our eyes, and nowhere is that more apparent than when we bridge memory cycles. DDR3 to DDR4 was billed as a marginal upgrade, but simple testing breaks that idea rather quickly. People tell you that only “enthusiasts” need higher end RAM, but with the price differences being tens of dollars instead of hundreds, the speed increase is more than adequate to justify the price jump. We topped out our benchmarks at 3000MHz. The AIDA 64 benchmarks were telling. Cumulative read speeds across multiple product lines and speeds. Cumulative write speeds across multiple product lines and speeds. Cumulative copy speeds across multiple product lines and speeds. Latency measurements across multiple product lines and speeds. With all this talk about value versus enthusiast, it’s easy to drop in the question about Dual Channel vs Quad Channel memory. The Crucial Ballistix Elite DDR4 modules are dual channel memory. Quad channel memory gets bandied about as a concept, and on paper the concept sounds better, because four is better than two, right? It turns out that there is little performance improvement (less than a single frame in most games) between the two technologies. Sites that specialize in digging into every bit and byte of memory testing, right down to the circuit have come to these conclusions, and I tend to trust their word. I’m not going to run down the comparative analysis path in this review, but the truth of the matter is that memory channel width will have very little performance difference in the current PC architecture. All of that is subject to change, of course, but as of this writing I encourage you to pick up the far cheaper dual channel memory and boards and save yourself a lot of heartache in trying to justify the price difference. As rugged and aggressive as their heat spreading fins, the Ballistix Elite DDR4 kit from Crucial came ready to tackle any scenario. Sporting a lifetime warranty, and able to handle even the highest clock rates, there was nothing I threw at this memory that it couldn’t chew up with ease. Just make sure you run some quick clock speed tests after install to make sure you are wringing every drop of power of out them.